We love summer, but our fashion hearts belong to fall. Cooler temperatures means fashion girls can get layering, and play with all the trendy new silhouettes and outfit combinations. 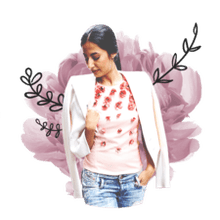 Before you go fall shopping though, take a look inside your closet, because looking up-to-date this fall is more about how you combine your closet pieces, than just buying the latest trends. We've rounded up plenty of cute fall outfits here, from some of our favorite street style influencers, to bring you these genius ideas for how to refresh your fall wardrobe this year. If you've got a pair of cropped jeans in your closet, here's how to wear them to look instantly stylish this fall. Simply add a long line plaid blazer, a cute purse, and a pair of chic pointy toe shoes—flats are just fine, if you don't like heels. Athleisure fashion basics are perfect for putting together casual, cute fall outfits. Here, a trendy pair of striped track pants are styled to look more chic than sporty, with a soft white blouse, white pumps, and a black leather bag. Jeans and a leather jacket are a classic fall outfit combination. If you want to stand out from the crowd, though, follow this fashion blogger's lead and choose a brightly colored leather jacket, which you can wear with everything from basic t-shirt and jeans outfits, to your favorite little black dress. Leopard print is a classic pattern that's having a real fashion moment this fall. Pair a chic leopard print blazer with jeans or black trousers, and a simple black top, for a sleek look that you can easily wear to work, or out to dinner. You'll see plenty of olive green fashion in stores this fall. We love the way a bottle green bomber jacket can instantly make all your basic outfits look more trendy this season, as pictured here. Wearing black is always chic, but it feels especially right when the temperatures cool. For a fresh look this fall, pair trendy white loafers with your favorite black sweater and pants. Wearing washed pinks and blues together is a major fashion trend now. Opt for muted pastel shades in a sweater and trousers, for a colorful and cute fall outfit that feels just right for the season. Buy a long camel coat for fall, and you can easily pull it on to add polish to any outfit. Here, a belted black top and skinny jeans look office-ready, with a camel coat layered on top. Fall's transitional weather means it's good to be prepared—but that doesn't mean being boring! Shop for a raincoat in a cheerful color and belt it at the waist, for a chic rainy day outfit that beautifully shows of your shape. What should you wear with that pleated skirt you bought earlier this year? Layer a cozy velvet blazer over it to create a cute fall outfit. This is a great outfit to wear to the office, with ankle boots or pumps. Checkered patterns are a major suiting trend for women this fall and winter. We love the Parisian-inspired day off look created by this fashion blogger, who matched a checked blazer with black trousers, a simple t-shirt, basic white sneakers, and a go-to cross-body purse. Want to extend the fashion life of your pretty summer maxi dresses? You can easily wear long dresses during fall by adding cozy layers that make them feel seasonally appropriate. Here, a colorful leather jacket and trendy white boots do the trick. When you go fall shopping this year, consider investing in a pair of over the knee boots. These fabulous kicks make everything you wear look fashion forward, from skinny jeans to dresses. Ponchos and blanket-style cardigans are your best friends when the weather turns cooler in fall. Throw one over your favorite jeans for an instantly fall-ready fashion outfit. We love how this fashion blogger has styled her outfit, with over the knee boots. Pantsuits for women have been trendy all year, and are perfect for wearing to the office this fall. You could choose a quieter fabric, but we just love the fashion forward look of a bright colored pantsuit worn with matching shoes. Don't stash away your denim overalls in the back of your closet when summer ends. You can easily wear overalls through the fall by layering a cotton tee underneath, adding a cozy cardigan sweater, and easy ankle boots. The leather pencil skirt is a versatile separate that you can use to create tons of cute fall outfits. We love the way this fashion blogger styled hers with a floral cardigan and simple grey top, to create a polished outfit for work or weekends. If you love fashion, you are probably going to buy at least one flannel shirt this fall season. You can wear this trendy piece so many different ways, but we especially like the styling here, with jeans and high heel shoes. Floral print dresses are perfect in summer, but you can wear them year round. Style your floral dresses for fall by adding a structured coat and a great pair of boots, as seen here. How cute is this dressed up sweatpants look? Steal this fashion influencer's style by layering a moto-style leather jacket over striped track pants and sneakers. We love the addition of a fun message tee, as pictured here. Fall's cooler weather is the perfect time to experiment with minimalist layered looks. Try creating an outfit from simple pieces in neutral tones, such as the simple turtleneck, flowing trousers, and basic black trench coat pictured here. Then add your own style, with trendy ankle boots, or a pair of fabulous earrings. Double denim is back in style now, but it can be challenging to wear without looking dated. What's the secret to making denim on denim look fresh? As seen here, it's perfect fit, distressed details, and fantastic shoes. This fall, a slouchier silhouette looks suddenly fresh. We love the way this fashion influencer has styled a striped menswear-style shirt and trousers to look effortlessly chic for autumn. Did you buy a pair of trendy high waisted mom jeans? You can create lots of cute fall outfits with them. We especially like the way they bring a cool, casual vibe to sheer, feminine tops, as styled here with a long-sleeved polka dot shirt. Want to look expensive in all your outfits this fall? Invest in a high quality wool coat that you can layer over all your basic and dressy outfits, to give them an instant upgrade. You'll find lots of long-sleeved mini dresses in stores this fall. We think this fashion blogger has found the perfect way to style this easy dressing piece to make it look polished, by adding tall leather boots and a high quality leather satchel. Look classy for the office this fall, by dressing in sleek separates in neutral shades. We love this black-and-camel work outfit that will make you look totally promotion-worthy. Lightweight summer separates can be worn for fall's cooler weather when you add cozy layers and accessories. Here, a graphic t-shirt and jersey maxi skirt are just right for fall weekends, with an essential denim jacket and black ankle boots. Suede is a fabric that's meant to be worn in fall. Add polish to a 1970s style suede outfit with classic accessories, such as the beige high heels and aviator sunglasses seen here. A military-style jacket adds plenty of fashion whimsy to all your fall outfits. We like how this fashion blogger has styled it, over an essential striped turtleneck and this season's popular flare jeans.